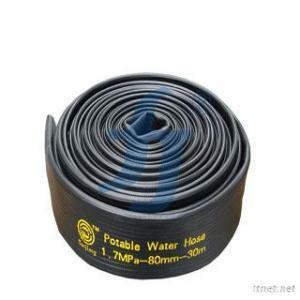 Potable Water Hose is used to convey large volumes of water over long distance. Its lining should be good quality PU, and it is usually double polyurethane or double rubber hose with large diameter and high-pressure. The warp of the jacket is made by high strength polyester staple or filament. And the weft must be high strength polyester filament with low elongation. The jacket should be evenly and firmly woven by circular loom and free from visible defects, thread knots, lumps and irregular twist. The polyurethane lining is not easy to multiply the bacterium and get corrosion, so it can guarantee the safety of potable water hose. PU Durable Hose has very big scope of heat resistance and its outer layer polyurethane lining can guarantee the wear resistance. So it is properly used for outdoor work.